Late in 2011 some experiments I was doing in “outsourcing” led me to The 4 Hour Work Week, the best selling book by Timothy Ferriss. Like many poeple who read it, I first felt “yes, this is great, I’ll get straight onto doing this!”, only to end up doing nothing very much. But I have used some of his ideas, with a bit of success. It has been comprhensively reviewed in lots of places, so I won’t do that. But here are a few quick thoughts and responses. It was a quick, interesting and great fun read. I really enjoyed it. Lots of it is very motivating too. I had already experimented with using outsourcing to get some of my work done, mainly some web research and basic article writing. I found O Desk particularly good. Also, Fiverr.com was also useful. I also used an Australian virtual assisstant service called Bridgeland. More expensive, but also did a terrific job for me on a more involved project. Using outsourcing is a big theme in Ferriss’ book. My experience with it has been that it is useful, affordable, effective and a great idea. It has, indeed, freed me up do focus on things that I would rather be doing or things that only I can do. I was intrigued by Ferriss’ ideas about training other people to respect your time, and controling your communications so as to free up your time. I tried several of his suggestions. Firstly, I engaged a good answering service to take all calls to my mobile phone. Calls are diverted and my phone simply doesn’t ring. They take a short message for me and instantly email and text me. This filters out time-wasting calls, abusive calls and spam, and means I can deal with the important things when I set aside time for it. People seem to use the phone almost as a way of manipulating other people, almost a subconscious power play. To ring someone is to demand their time and full attention, there and then. People call, obviously, when it is convenient for them, but seemingly with little thought for the recipient. My method has circumvented this. I deal with it when I am able to give it proper attention and at a time when it isn’t distracting me from some other important task. Ideally, people will email me. Email is perfect: the author can craft a considered note, spelling out all the important details. They can send it at whatever time best suits their schedule. The recipient can respond in the same way, also at the time that suits their schedule. For instance, if I am not free until after midnight, then I can easily email someone then. On the other hand, I can’t phone someone that late. I have set up an alternative way for immediate family and closest couple of friends to contact me. Following Ferriss, I have established “rules” for contacting me. The best way to get me is email. I won’t respond to or answer anonymous calls. I won’t respond to any message that doesn’t spell out who it is and what it is about – I refuse to enter into manipulative back and forth time-wasting. I won’t answer the office phone before 1:30pm: people can leave a message, email or call back when the phone is attended. The brilliant thing about all this is that it has worked. I still get calls, but only the important ones. People email me on business matters far more than they call. I have chosen a lifestyle that doesn’t earn a lot of money for me, but I now have a lot of free time to do the things I want to do. This includes running my business, and walking, and just running! At work, we have also adopted Tim Ferriss’ 80 20 rule: 80 percent of your business comes from 20 percent of your customers. 80 percent of your problems come from 20 percent of your customers. Therefore, give extra to the good 20 percent, and either ignore or “sack” the bad ones. Singing lessons in our music school were always a nightmare. The students were ultra-unreliable, flakey and just tedious. The teachers were often awkward too. the solution? We got rid of them, stopped offering singing lessons. We haven’t looked back since, it has been brilliant. We no longer bend over backwards for everybody. If someone is nasty or a real timewaster, we are happy not to have them. At the same time we try even harder to help the good people. It works brilliantly. 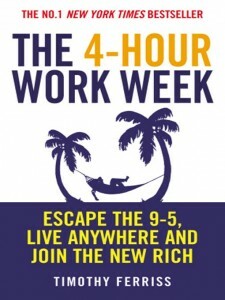 I’m still not working 4 hours a week, but that isn’t the point of Tim Ferriss’ book. Just by adopting a couple of his suggestions I have transformed my life and my business for the better.